Other Products by BSN. Search other Pre-Workouts products. If you have been around the bodybuilding and gym scene for some time, no doubt you will have heard about NO Xplode, or used it yourself at some point. This is a tried and true product that unleashes what it always has, superior power, strength, stamina and pumps, with the NO Xplode Master Performance Blend. That's why this product still lines the shelves of gyms, health food stores and supps stores. Its an absolute winner that was brought back by popular demand. NO Xplode provides maximum potency with a superior ingredient technology so you can smash through plateaus and push your limits of workout supremacy. 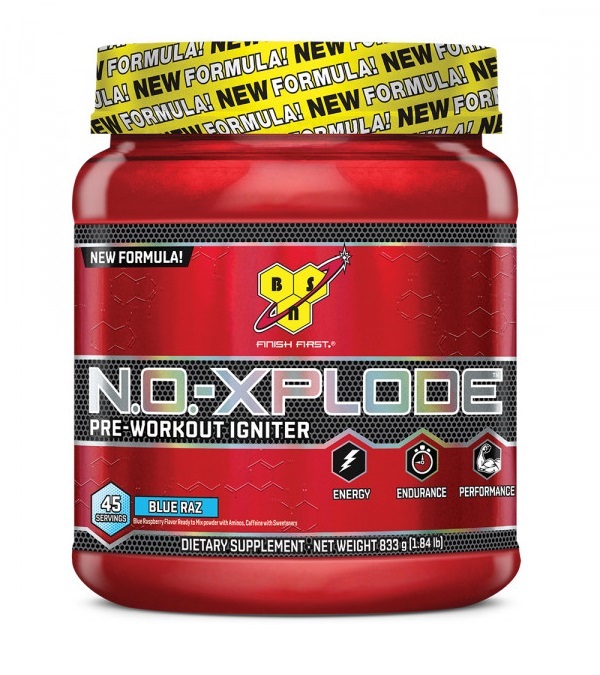 Taking BSN NO Xplode is like reefing the lid off a pressure cooker. Watch out for that RUSH OF ENERGY! This product rivals any pre-workout on the market. With Tyrosine, Huperzine A and DL-Phenylalaine the ultimate mind-muscle connection is created. Discover superior strength gains and power output from a unique creatine blend within the Myogenic Matrix alongside AstraGin to potentiate its effects. Combined with the NO Alpha Fusion Matrix, a strength surge and full body pumps are on offer to rival any previous workout performance. Feel the blood engorging to bring a new sensation to the meaning of pump. With weights skyrocketing the Endura Shot will keep you moving masses of iron long after the muscles should have given out. Find out what it means to train with absolute intensity, then reap the rewards of your hard work with BSN NO Xplode. Mix 1 Scoop (18.5g) into 500ml Cold Water and consume. Be careful using a shaker bottle (protein shaker) to mix this product, as it can blow the lid off mid-shake! That's how explosive it is! The new Nox is far better than all previous models. Huge pumps that seem to last for hours. The energy from the caffeine is gradual but builds and after the hour mark there is no crash and you want to keep training. Focus and mental clarity 10/10. - L-Lysine HCl, DL-Phenylalanine, Niacin, Calcium D-Pantothenate, Toothed Clubmoss Extract (aerial parts) (1% Huperzine A), Pyridoxine HCl, Thiamin HCl, Cyanocobalamin. NO Xplode INGREDIENTS LIST: Flavours, Citric Acid, Malic Acid, Calcium Silicate, Silicon Dioxide, Sucralose, Beet Powder, Acesulfame Potassium. How Can I Use Protein To Lose Weight?